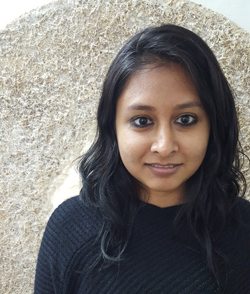 Baroda-based artist Mitali Shah is a curious observer of cities under different phases of turbulent growth. She captures their transitions using a variety of mediums. She developed an early interest in using the visuals of the city to relay her thoughts. “I go deeper into the surroundings with my mental telescope; I uncover and examine the lower strata of unseen existence”. Preoccupied with grids and woven forms in nature, she used branches and roots, leaves and veins, spider webs and maps as points of departure for her practice, and gradually worked on the making of projections of cities as chaotic entities. In her most recent works, Shah developed a metaphor for the city’s skin under torment -- burnt and torn in stages. The constant shifting and adaptations and the sometimes hidden history of these changes in cities lie at the heart of her work. Her intention is to capture the reactions of inhabitants to the physical space and the relationship between the self and the changing surroundings. She explores their readings of the Place, which she describes as “a narrative constructed from extreme proximity”. From the observation that cities spread relentlessly like an infestation in suffocating profusions, she seeks to expose specific elements and magnify them. The explorations of the possibilities of parasitical growths, infestations, damaged flesh, bruises, irritated skin and blood clots, allowed her to suggest organic associations (using organic materials such thread, rice paper, jute fibers). She manipulates the identity of the material by burning, deforming and layering it, and uses this as a catalyst to portray the elements of tension and fragility. “Sometimes, I am more interested in how things come together and other times in how they may fall apart”. Mitali Shah (born in 1987) completed her Master in Visual Arts (Painting), 2011 from Faculty of Fine Arts, M. S. University of Baroda, India. Her works have been part of several shows in India & abroad including 'Minimal affinities' - Nine Fish Gallery -Mumbai, 2015; VadFest - Baroda, 2015; ‘Residual Remnants’, curated by Rekha Rodwittiya - Site Art Space, Baroda, 2014; 'Urban Cartographers' - Gallery Beyond - Mumbai, 2014; Two persons show 'Fluid Frames' - Chennai Lalit Kala Academy - Chennai, 2014; ‘The 2ndYoung Artists Exhibition -The Emerging Canvas II’ organized by Tagore Society of Korea & Indian Art Museum - Gallery Art Space K - Seoul, Korea; ‘SaraiReader 09 - the Exhibition’ curated by RaqsMedia Collective in association with Sarai Media Labs - Devi Art Foundation - Delhi, 2012; ‘Thinking Spaces’-curated by Ranjita Chaney - Gallery Exhibit 320 - Delhi, 2011. She participated in several art fairs including the Indian Art Fair in 2013 & 2012, Busan International Art Fair in BEXCO, Korea 2013. Mitali received the Inlaks Fine Arts Award in 2011 and the Nasreen Mohemmedi Scholarship in 2008 among others. She works out of her studio in Baroda. © Shifting Frames. All rights reserved.